One green way to solve mosquito issues is purchasing dragonfly nymphs from Scarborough Community Services. Nymphs eat mosquito larvae before the mosquitoes hatch. As adults, they catch mosquitoes on the fly. All nymph orders must be received by Friday, May 16, at noon. There is a limited quantity of nymphs, so orders will be processed on a first-come, first-served basis. Call 730-4150 or see www.scarboroughmaine.org/departments/community-services for a downloadable order form. On Saturday, May 4, 9 a.m.-noon, Camp Ketcha, 336 Black Point Road in Scarborough, will host a morning of magic, enchantment and fun for all ages at its Fairy House Festival. Tickets must be reserved online and are $10 per person, although children 2 and under are free. Go to http://campketcha.org and click on the special events tab to sign up. The 28th annual Scarborough Kiwanis Kids Fishing Derby will be held on Saturday, May 3, 9 a.m.-2 p.m. at Bayley’s Camping Resort, off Pine Point Road. The derby is open to children 4-15. The cost is $3 per child and all participants must be accompanied by an adult. Participants must also bring their own fishing poles. The Scarborough Library is hosting the following events in May. All are free and open to the public. Call 883-4723 or see www.scarboroughlibrary.org for more information. The Scarborough Garden Club and the Scarborough Public Library are working together to present the “Gardening in Tune With Nature.” Reeser Manley and Marjorie Peronto, authors of the newly released book, “The New England Gardener’s Year,” will be on hand to discuss how to create a healthy ecosystem in your garden and ways to attract pollinators and other beneficial insects. The library is working in collaboration with the Maine Humanities Council to offer a new pilot program – “Let’s Talk Graphic: Coming of Age Comics.” This discussion series is for students in grades 9-12 and includes a chance to try different elements of comic and illustrative art. The series also includes three more sessions on May 20, 27 and June 3. To register, call 883-4723, ext. 3. Get the answers to important questions about estate planning with Jean McDevitt, an attorney and tax principal with Baker Newman Noyes, LLC. McDevitt has extensive experience with trusts, estates, and personal tax planning. The monthly meeting of the Scarborough Historical Society will be held on May 7 at 7:30 p.m. A brief business meeting is held and followed by a presentation. The meeting is held at the society’s museum and meeting room located at 647 Route 1 (adjacent to the Dunstan Fire Station). All monthly meetings are free to members of the public. However, donations are always welcomed. The presentation is about one hour in length. Max Brandt will discuss and describe the Abanaki tribes who lived along the Saco River. Their culture and way of life will be the central theme of his program. He will describe their association with the Native Americans located in what is now Scarborough. His program will be focused on pre-Colonial decades. Recently, representatives of the Scarborough Public Library signed on to the Declaration for the Right to Libraries. 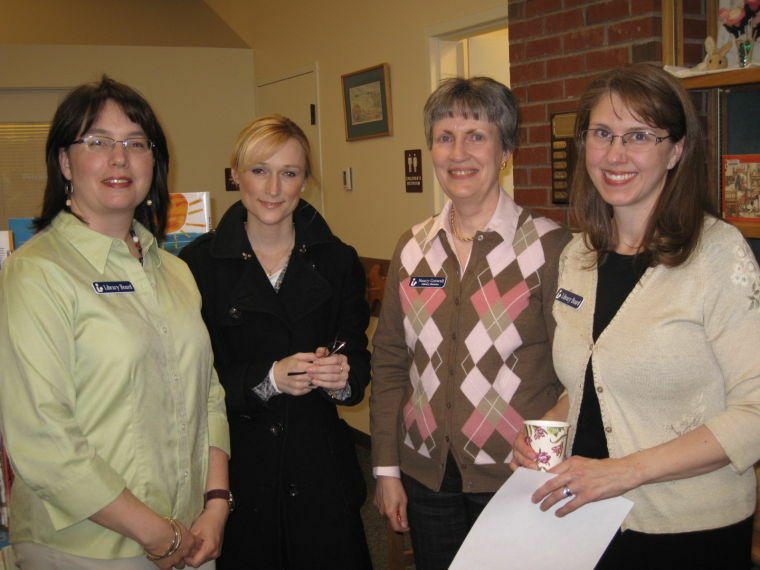 Pictured, from left, are Linda Elliott, president of the library board of trustees; Kate St. Clair, Town Council liaison to the library board; Nancy Crowell, library director; and Emily Read, vice president of the library board.